Does anyone hear have Disney nostalgia and love The Little Mermaid? Why are we even bothering to ask? For those who loved it as a kid or does who know have kids is a new way to experience the film at the Hollywood Bowl. Get tickets here starting Friday April 5th for the special showing May 17 & 18th. DISNEY'S THE LITTLE MERMAID will be given new life for two special evenings under the sea at the Hollywood (Fish)Bowl. 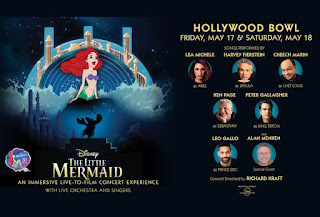 Coinciding with the 30th anniversary of the classic Disney film, the production features an all-star cast of performers including Lea Michele (as Ariel), Harvey Fierstein (as Ursula), Cheech Marin (as Chef Louis), Peter Gallagher (as King Triton), Leo Gallo (as Prince Eric), Ken Page (as Sebastian) and special guest Alan Menken, who will perform the songs from the Oscar® and Grammy® -winning score as the film plays on the Bowl's movie screen accompanied by a full, live orchestra. Celebrated songs from THE LITTLE MERMAID will be performed live on stage by the incredible cast, accompanied by orchestra with fan-favorite musical numbers including "Under the Sea," "Kiss the Girl," "Poor Unfortunate Souls" and "Part of Your World." To expand on the musical experience, a number of songs from Broadway's The Little Mermaid will be incorporated into the evening. To make this event even more immersive (and submersive) this iconic venue will be transformed into the Hollywood Fish Bowl Dive-In Theater for a magical night both under the stars and "under the sea." To recreate the feeling of an underwater night out at the "dive-in," in addition to the feature film, this evening will include a full program of aquatically-themed previews of coming attractions, nostalgic animated snack bar commercials, and the 1938 Silly Symphony cartoon "Merbabies" featuring the world premiere of a live original score composed and performed by 17 year-old piano sensation, Emily Bear. Audiences are also invited to participate in a Little Mermaid themed costume contest and unique photo opportunities to get them in the spirit before the show starts. Additionally, the award-winning creative studio Mousetrappe will return to harness state-of-the-art projection mapping technology to project newly created and breathtaking animated "living scenery" onto the façade of the Hollywood Bowl, making the event an evolving extension of the beloved film and score. These projections will emphasize an immersive Dive-In Theater experience for the audience.